Rose Cottage Self-cateringRose Cottage is the perfect holiday cottage for family or friends, for a break "away from it all" in the North Lakes, sleeping four people. The Five Star, Gold Award luxury cottage provides all the modern convenience you expect yet with a rustic charm of former times; a flat screen TV with Freeview, Wi-Fi and a Bluetooth speaker system, Blu-Ray player and digital radio are found the in living room alongside a log burner for colder nights. The kitchen provides a dishwasher, induction hob, pyrolytic oven, microwave oven and fridge freezer and under floor heating. The bedrooms are equipped with hairdryer, flat panel TV's with hard drive recorders and bath robes. The separate WC and bathroom are both underfloor heated with the bathroom having a massage and spa bath and a large shower with body jets. Outside are spacious well stocked gardens with patio, seating, chiminea and BBQ. Vehicles can be parked in the private gated driveway. Rose Cottage offers weekly bookings starting on Saturday and sometimes short breaks. Take jct 41 from M6 and turn onto the B5305 towards Wigton. After approximately 8 miles, turn left on a bend signed Hesket Newmarket. Follow this road for 3 miles through Millhouse until your reach Hesket Newmarket. Just as you enter the village turn left before Denton House bed and breakfast, Rose Cottage is 100 yards further up stone track. 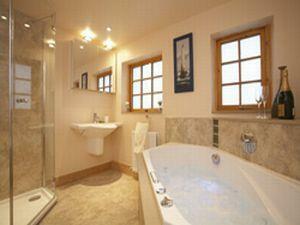 The cottage is beautifully presented and has period charm in a lovely village setting. It is very comfortable and well equipped. The service from the owners was excellent .